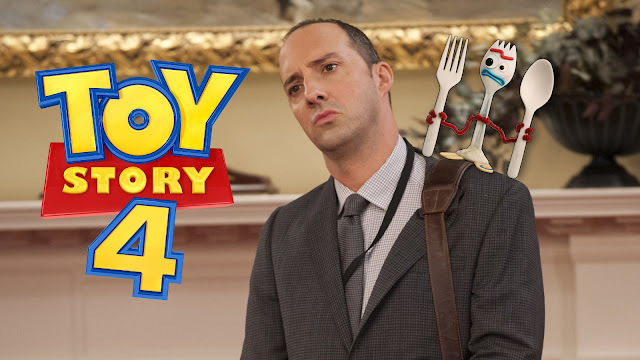 Just the other day while rewatching some episodes of the hilarious political comedy, Veep, we noticed that Gary Walsh (Tony Hale's character) had an adjacent connection to Forky from Toy Story 4 that had us chuckling. In Tony Hale's very first line in episode one, he says, "Ma'am this is the fork. Ma'am, this is the new cornstarch fork, Ma'am. See, I got the cornstarch spoon, too if you want." We couldn't help but laugh as he showcased a fork and a spoon which, of course, combine to make a spork. So, was Tony Hale destined to play Forky? LOL! Check out the clip embedded below or directly on our YouTube channel. It's also great rewatching Veep because you get to hear from Julia Louis-Dreyfus, who will be voicing her second Pixar character in Onward — her first Pixar character was Princess Atta from A Bug's Life. While rewatching episodes of Veep the other day, we noticed a funny thing about Tony Hale and his opening lines about a fork and spoon - leading us to wonder if Tony Hale was indeed destined to voice Forky in Toy Story 4.